SP-002 Screen Printing Machine (New Model). On demand and need of the customers & market, Our (MTC) screen printing machine with exclusive design, easy detachability & installation, simple operation, lowest price but also having the parallel working principles & functions as other screen printing machines , which is the top choices for new user to start a screen printing production and business. 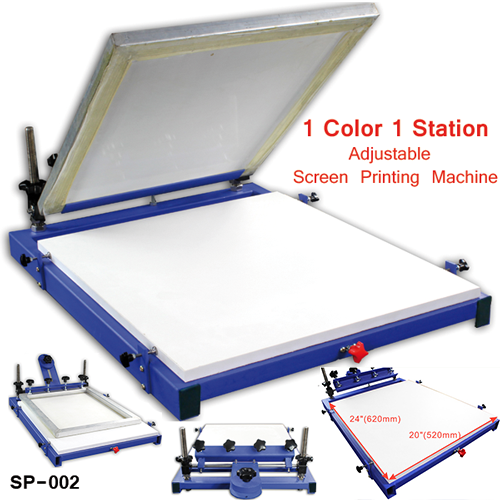 SP-002 micro-adjustable screen printing press with big printing platen is one of our latest models. It has kept functions of traditional one, like as adjusting platen right side & left, back side and front; adjusting height of screen printing chucks for suiting different substrates, and so on. In adding up, it has a number of special features. Adjust the position of disc gravity rising and down will facilitates screens with different sizes and weights. Gravity-hole device for extra heavy screen frames. The gravity hanging-hole device is specially made for extra heavy screens, which is easier and more suitable. The set platens are much bigger than the normal ones, which is “especially appropriate for sign-board & signage printing”. The platens are environmental & made of high solidity melamine materials, which is anti distortion, water-proofing, rust resistance and simple to clear. The platens are separately installed on the equipments, so if you need much larger printing area, only remove several bolts for change another bigger platen. All our equipments are perfectly packaged by high-strength five-layer corrugated carton, inside with standard soft and hard foam and three-ply board, all metal parts are separate packaged, which guarantees product safety during transportation.